The first of three new PNRNetworks podcasts for 2019 is here! 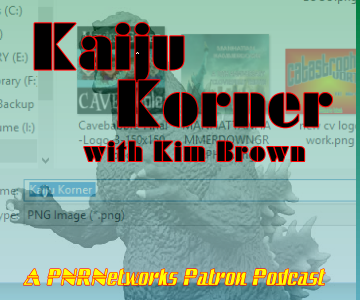 “Kaiju Korner with Kim Brown” debuted it’s first episode last night, celebrating Kaiju movies of all shapes and sizes! 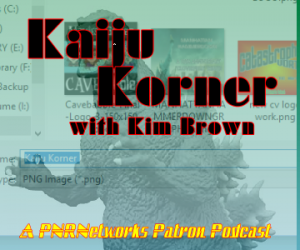 “Kaiju Korner” is Kim at her very best talking about something she truly loves – Kaiju movies! In her first episode, she goes into how she became a Kaiju fan, why she remains one, and in future episodes, debuting every other Wednesday, she’ll get into the guts of various Kaiju films. Kim has been working for months on getting this new podcast just right, and it’s sure to be fun for Kajiu fans of all ages. The new podcast is the first of three new podcasts debuting in the next two weeks that are EXCLUSIVELY for Patreon Patrons at the $5/month level and above – it isn’t and won’t be available anywhere else, and you don’t want to miss this fun and exciting look at Kaiju films from Kim’s unique perspective. To listen to this show, support PNRNetworks, and unlock this and tons of other great Patron-exclusive perks, become a Patron today – head over to http://patreon.com/PNRNetworks and sign up today! We are now in day eight of PNR’s catastrophic system crash, and over the weekend, some slow progress has been made. I did make the discovery that it was NOT hard drive failure that caused the crash, but a power supply failure. So thankfully most of our stuff is still intact, even if I can’t get to it right now. I’ve got about 50 programs to redownload and reinstall now, since Carbonite’s backup was woefully under-supplied – I really need to keep a much closer eye on this. And of course, there’s no easy way to move the programs from one drive to another. I purchased a program that purported to make this painful process much easier, but for some reason, it’s not seeing anything on the old drive, even though it’s connected exactly the way it’s supposed to. I’m going to be very pissed if this turns out to be a total waste of our funds…I have an inquiry into the software people, so hopefully we’ll get it sorted out, and if we do, hopefully rebuilding stuff will be much easier than it has been. Except when it comes to reinstalling the back up…which is taking FOREVER…. Carbonite tells me “a few days” – at this writing, when I’ve had the new box up and running for over 24 hours, we’re only 6% into the rebuild. And I have been advised NOT to install any of the production programs again until the rebuild is complete. We’re gonna be down for another few days when it comes to podcasting. I can access the blog and keep it going, but no audio or video production until things get back to normal, which MIGHT mean we could maybe possibly get a Subject:CINEMA done this weekend, but I’m very doubtful that we’ll be back up in time for it. SO there won’t be any Three Minute Weekend this weekend (which is OK, and I’ll cover what I missed and put it up when I DO finally get back up, same for Tuesday Digidex this week and probably next week too), but we are right now thinking that the first new show on the new machine will be next Wednesday’s edition of Kim’s wrestling show, Ring Around The Rosie. But if we DO get back up to speed before then, you’ll know it if you follow or subscribe to the blog here and our other sites, which I’m also posting these updates on. So stay tuned, all, and thanks for your patience. All I can say is thank goodness all this happened when I was scheduled off of work for a week for some downtime. It’s not at all how I planned to spend it, but at least I have the time TO spend it…phew..
Another update coming Saturday…stay tuned! I clicked “save” and the shows supposedly saved…and then…nothing. The screen suddenly went totally black. No noise, no warning, no anything. Main hard drive failure. TOTAL COMPLETE FAILURE. And I mean failure. There is NOTHING happening inside the box when I turn it on. I can hear it come on, the power supply pumping up, and..the drive lights are black. Now, thankfully, we had already been planning to get a replacement machine and upgrade our production equipment. And all the files – not the many programs, but the files – are all backed up in the cloud. Phew! So now, instead of using this week while i’m off from work to get things completed and rolling again…I have to spend it getting the new production machine – several weeks before we were ready for it – then repopulating the drive, getting programs reinstalled, etc. it’s a very frustrating situation, and for some reason, it always happens RIGHT when something HUGE is on the way. Long story short – i’m not sure what will make it to air later this week. The preview show will be redone next weekend. I may miss Tuesday Digidex this week, but hopefully we’ll be back up and running later in the week. In January, we will be launching THREE BRAND NEW Podcasts on Patreon, available EXCLUSIVELY to Patrons at the $5 level or above each month – Subject:CINEMA’s Review Revue, Subject:CINEMA’s Freeze Frame, and Kaiju Korner. We first told you about these new shows in September, so you can check out this post for more info on these shows. January will also bring the season premieres of Subject:CINEMA presents Front Row Five And Ten and Catastrophe Vortex (which has been completely overhauled). Over at my music site, The Kirkham Report, I will get back to my music video countdown shows before the new year is here, and lots more coming for the new year, trying to work around YouTube’s ridiculous restrictions on some stuff (it’s not their fault, it’s the legacy recording industry, who are still stuck in the 1970s), but I WILL DO IT. That means back to the TKR Hot 20 show on Saturdays, the TKR Retro 20 on Tuesdays (possibly moving to Patreon soon), and plenty more features as well. You can check out the videos on PNR’s YouTube channel. More on what happened is over here at TKR. And after the fun and craziness we’ve had doing the first two shows, we are planning two, and possibly three, original PNRNetworks AudioVisual Productions dramatic presentations. 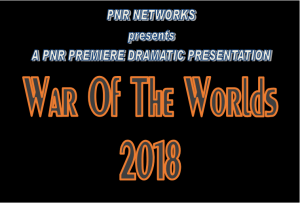 Next Halloween, we’ll bring you an enhanced version of our “War Of The Worlds” production from October 2018, with added EAS Bulletins and such (the way it was originally supposed to be done this year but time constraints didn’t allow for it). And there will be at least one original drama coming DEFINITELY coming your way in May 2019, and POSSIBLY a second later in the year. I truly do wish more people had heard them and were aware of them, but those who listened to them, THANK YOU! If you haven’t checked them out yet, please do – “Manhattan Hammerdown: As It Happened“, our tenth anniversary tribute to “Cloverfield” is here; our 80th annual homage to “War Of The Worlds” is here. For those of you who are regulars to our website at eCinemaOne (and if you’re not you SHOULD be, heh heh), we’ll get back to more-regular postings, including hot new trailers, several regular columns, including a brand new one – The Whole Ketchup (tentative title)- debuting in a couple of weeks that might drive some people – particularly online film critics – nuts. We’ll also be posting some stuff EXCLUSIVELY for Patreon Patrons as well. eCO has also declared 2018 to be The Year of the Film Festival, and in January, in tandem with S:C, we’ll be launching our new “Fethival Central” features and series, which we’ll give you full info on later this week in a press release, but basically, we are aiming to become THE website for film festival coverage, even when we can’t get to all of them. Anchored by our annual staples “Fethival Of Film Fethivals” and “Boston Springs A Fethival” episodes of Subject:CINEMA in January and May each year, we think our coverage will be worth watching. It’s a HUGE undertaking, one that I think will benefit the millions of film fans out there. S:C spinoffs Tuesday Digidex and Three Minute Weekend will also be out there every week on Tuesdays and Fridays bringing you the rundown of the latest theatrical and home video releases, just like they have been doing for most of the past decade. eCO’s Hub-centric sister site eCinemaBoston is also gearing up for tons of new posts and blogs: after several years of severe stagnation, and after weathering several closings in the metro area, including smaller theaters in Sharon and Danvers, Boston is suddenly becoming a theater boom town. With two huge new theaters opening in the past year – AMC’s South Bay Center 12 in Dorchester and Keresotes’ luxury Showplace ICON Boston in the fast-growing Seaport district, neither of which we’ve been to yet – and two more to come – an as-yet unnamed tenant at the under-construction Roxbury Crossing project in Roxbury and the new 15-screen-plus-restaurant Arclight Boston @ Hub On Causeway, attached to North Station and also presently under construction – in the next 18 months, PLUS potential for possible new theater locations in the ‘burbs at the Suffolk Downs Redevelopment in Revere (Hey Alamo Drafthouse: we’re WAITING…::taps foot::) as well as the proposed renovation of what was once the AMC Harvard Square in Cambridge (planning board meets in January on this proposal), we are about to be deluged with bright and shiny new multiplexes. Having said that, however, in addition to those and the many various Showcase, AMC, and Regal locations around the area, there are also a lot of smaller theaters within a 50-mile radius of Boston, and in the next year we will begin to undertake a project to visit and spotlight these as well as the big boys and hopefully paint a broad, beautiful portrait of Boston as America’s fastest-growing premiere theater center. We plan to launch a series of portraits of individual theaters, and especially those smaller, often family run, theaters in the outlying areas of the metro area in June, following the busy Boston Spring Festival season. We are always working on developing new and fresh ideas for our readers and listeners and this coming year is no exception. However, doing all this is very hard work – as much as we love doing it all, it’s very time consuming, and in order for us to really be able to give as much as we can, we need to concentrate on finding a way to give one of us the ability to work on it FULL TIME. And we can’t do that without your help. I have to admit I’ve been very disappointed by our Patreon campaign efforts. We have literally thousands of readers and listeners who enjoy our shows and posts, but as is normal for web and video sites, almost no one seems to be willing to chip in for what we’re doing. We don’t take advertisements or run ads, because we want our shows and sites to be clutter free and also free of any kind of influence. When we did have a few of them – back when Mevio was our podcasting home – we did make a little here and there, and that was very helpful. However, after Mevio shut down, it became very difficult to do things for awhile. We persevered and managed to keep going to where we are stable enough to keep things going, and now have a budget that includes our online activities. But it’s a very minimal budget and doesn’t allow us to do as much as we’d like nor as much as we should be doing. In January, we will introduce a new set of prices and perks over on our Patreon, and we’re going to premiere our new shows there because we hope our listeners will be devoted enough to be motivated to become Patrons and enjoy some other material that will be exclusive over there and some really terrific perks for their help as well. It doesn’t cost much – it’s low enough that you shouldn’t even notice it – we have a starting level of $2 a month – for that you’ll get listed on our Patron page across the PNRNetworks family of sites – and the $5 and $10 levels will have some really great new stuff as well – $5 gets you THREE brand new podcasts each month and $10 will net you some other great stuff we’re still working out right now. There will also be levels at $25, $50, $75, and $100 levels with the perks going up and up. NOW is the time to sign up and become a patron – you’re going to get a HUGE amount of exclusive original material from eCO, eCB, TKR, S:C and more if you do! And your support will help support all our sites and shows, including our friends at PNRNetworks shows Cavebabble and Ant B.’s Nerd Grotto, Kim’s shows Platinum Roses’ Garden and Ring Around The Rosie, and help in the development of new shows, sites, products (we have a swag shop debuting in January covering the entire gamut of PNR Shows and sites) and programming. So PLEASE come on board – please go over to http://patreon.com/pnrnetworks and join what we hope will be a new wave of Patrons in the new year! We’ll see you back here for Subject:CINEMA on Monday, December 31st and the annual TC and Kim “Just ‘Cause We Can”awards! And keep tuned throughout each week at eCinemaOne for all the latest awards news! And THANK YOU FOR YOUR SUPPORT! PNRNetworks and its family of podcast personalities are pleased to present our second dramatic presentation! “The War Of The Worlds”, by H.G. Wells, adapted for the podcast medium by TC KIrkham. Presented by the PNRNetwork family of podcasts! Our players (in alphabetical order): Kim Brown, TC Kirkham, Anthony Lamberti, Courtney Lyon, Eric Lyon, Valerie Lyon, and Matthew McCallum! This has been in the planning stages since before our original Dramatic Presentation, “Manhattan Hammerdown: As It Happened” was released in January 2018. But because of various issues, we were wondering if we could actually pull this off, with only a couple weeks to spare, but we did it! This year is the 80th anniversary of the original broadcast of the Orson Welles classic from Mercury Theater Of The Air, and also the 30th Anniversary of the National Public Radio edition from 1988, and the 50th anniversary of the marvelous take on the story from WKBW-AM Buffalo NY in 1968. It’s also the 40th anniversary of the unbelievable musical version from record producer Jeff Wayne! We have tried to pay tribute to all four versions here, and we hope you like what you hear! LIKE – SHARE -SUBSCRIBE! Please share this with your friends on YouTube, as well as Facebook and Twitter, and dont’ forget, PNRNetworks shows do not take advertising, so please don’t forget to consider becoming a Patron at http://patreon.com/PNRNetworks. PNRNetworks’ home site is http://ecinemaone.com – please check it out and check out all our shows and podcasts! Retro20 is here! Our first weekly chart countdown that delves into the vast archives of TKR Charts counts up the top 20 hits from the week ending August 28 1982! Check it out below! Today, dear friends, is National One Hit Wonder Day, a fact that I would have completely missed had it not been for our local news bringing it up. For those who don’t know, a One Hit Wonder is a musical artist who manages to hit the top 40 once and only once. Of course this varies by country, but the US uses BIllboard as the starting point. A TRUE One Hit Wonder is someone who hits BIllboard’s Hot 100 only once, although of late that has been amended to strictly top 40 by many people. Here’s Spotify’s channel devoted to those greats who come hard, burn brightly, and go too fast – and some of them still may return one day soon. Let’s all have some fun today, shall we? Drop us a line and let us know what your favorite One Hit Wonder is! It’s time for the launch of my newest TKR series, XXBest! And a shout out from TKR to our peeps on our music and bookstores blog Planet BiblioMusica too! We’ll kick off this new, hopefully weekly TKR series, with one of the finest and sometimes most unfairly maligned bands around – my boys from Tulsa, Hanson! I have been a fan of the brothers since their major label debut, have seen them numerous times in concert, been a card carrying member of their fan club for more than a decade now (I think, might be just less than that), and have been rewarded greatly with incredible tunes the likes of which put to shame much of the crap on the radio today. So sit back and check it out! And don’t forget – LIKE! SHARE! SUBSCRIBE! TWEET! FACEBOOK! And all those assorted things! And please become a patron at http://patreon.com/PNRNetworks !